(This is a crosspost from WabiSabi Sound's blog). I didn’t think Witness was going to be an easy project by any stretch, but I certainly didn’t expect it to be one of our biggest creative challenges. I’ve worked on nearly 80 projects spanning feature film, games, ads and other sorts, and my job as sound designer had always been to broaden the experience in every possible way. The Witness inverts this notion. A tree of any significance in a film or game will have a bird perched on its branches chirping away. Cicadas will buzz. Wind will rustle its leaves. Branches will creak, stress and morph right before your ears. All this happening without you actually seeing it…or really expecting to, interestingly. In The Witness every element has purpose. 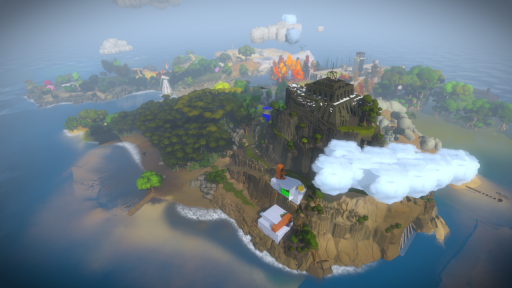 A key game mechanic, in fact, relies on the player’s perception as they explore. So, we’re not just talking aesthetics…noise (literally stated) ruins the game’s playability. Noticing, as a buddhist would call it, is key to discovering solutions and even finding the puzzles themselves. Nothing in the Witness is superfluous. All this said, the island is a tangible living breathing organic place following roughly the same laws of our universe. The trees exist. They have mass and energy. My eyes receive bands of light reflecting off them, and in fact they are quite beautiful. So then what do my ears hear? Silence is not only a bad artistic choice, it's untrue. At this point, you’ve probably asked, “What about music?” It’s no spoiler that there isn’t a gigantic speaker system in the sky fed by a mic’d orchestra. So…. None the less, the island is a fascinating place, with lots to see, hear and do. Geoff and I ‘the audio team’ have had an interesting time exploring 1000′s of layers of sonic subtly, and finding ways to engage players to listen ever deeper. This is a unique project for game sound, and we though it would be of interest to share our challenges and discoveries since starting with Jon in 2010 (and of course the challenges yet to meet). It’s funny- I was just playing Noctis IV. Silence was perhaps more of a resource constraint at the time, but it’s a game that flourishes without sound, and still manages to be one of the most artistic games of all time. Indeed, silence is a great artistic choice in cases. The absence of something important sends the mind in all kinds of interesting directions. Thanks for posting this Andrew good sir. It excites me to hear you say that this is the biggest creative challenge you’ve ever worked on. I appreciated to hear your mentioning of how The Witness has an inverted approach that is geared towards focused precision and functionality rather than the most aesthetic grandness you can cram into a package. That’s a good clarification to ponder. I’m very excited to see a game where ideas reign instead of a superficial fantasy world that bears no useful connection to our own, and I haven’t been excited about a game in a long time. I’ve never actually thought about music in The Witness. From everything I’ve seen, it just doesn’t seem like it’s a game that would want, let alone need, music. I really appreciate that sound crafting is such a big consideration for this game. I myself advocate sometimes about the importance of “game sounds” which includes charismatic sounds (half life, nintendo), gameplay sounds (quake, …). I dislike the tendency to put movie sounds like orchestra and voice acting. Judging from the trailer, it’s a small record player in the stump of a tree. Hey Jon, please (if you can) use lossless sound files. Playing games with a good headphone setup can really bare the distortion and fatiguing qualities of .ogg or even 320kbps mp3 files. FLAC is a good choice for balance between space and compression as they decompress in real time as you listen. You had me at the 792nd footstep sound. The posts about tree and terrain generation led me to believe that there would be no such thing as a background in this game with even grass given such painstaking detail, and it’s good to see the audio is getting a similar treatment. Usually, decisions about what sensory input is important aren’t left to the player, and I’m looking forward to reading more about what that means in terms of sound.